Spreads, tips and more from deck owners like you! Receive emails when site is updated. Enter your address below. Terri B modified a Celtic Cross just a little by using "What to Take From the Past" in the "Past" position. And using "Advice" instead of "Outcome". These tiny changes can make a big difference in what you get out of a spread. Terri's layout is a bit different because the table was so narrow—she would normally lay this out like a regular Celtic Cross. About the Deck of 1000 Spreads, she says, "the real beauty is that I tend to use just a few spreads...but this gives so many options. 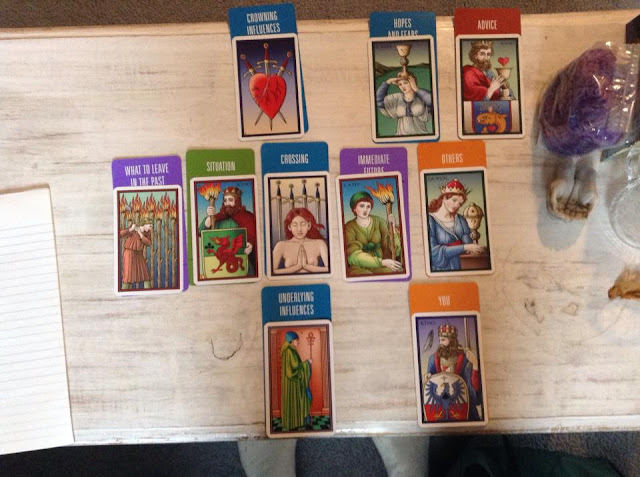 Also, I believe it helps the sitter 'remember' as we weave the story, how the positions interact....Also, I loved that she noticed more in the cards themselves...She commented on elements of the Sevenfold (Tarot of the Sevenfold Mysteries) cards...the dragon, the feather and added support to the reading." I've heard Terri's point about the spread cards opening up deeper collaboration with querents a few times before. When I first started thinking up this concept, I thought it might not be something professionals would embrace. But it turns out I'm wrong. In fact, this "easy tool for learning spreadcrafting" has become a professional's best friend and I couldn't be more thrilled.